Hello, little mining bee! This ground-nesting bee belongs to one of the largest groups of bees (Andrena), thought to contain around 1300 species worldwide. Close-up of Andrena prunorum male. Identification Tips: Andrena prunorum can vary in color based on region. They are often orange or red tinted bees with dark wings. 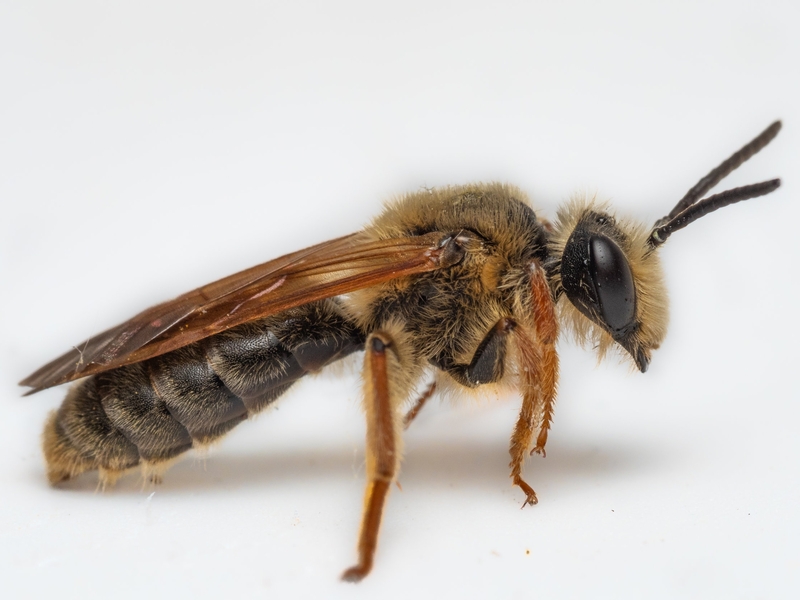 Like all bees from the genus Andrena, they have fuzzy hair between their eyes and antenna in groves on their head called foveae. These bees are slightly larger than most other Andrenids, measuring about 12-14mm (just slightly smaller than a honey bee). They are fast bees, moving quickly from flower to flower. Females carry pollen on special hairs on their hind legs and on a space between their thorax and abdomen called the propodeal corbicula. Nesting Habits: Females excavate a nest in sandy soil, building several cells off the main tunnel for brood chambers. These cells are lined with a waterproof secretion. After several foraging trips, she mixes nectar and pollen to form a pollen ball, on top of which she lays an egg. The larvae will consume the pollen ball and molt before pupating in its cell. These bees most likely overwinter as fully formed adults within their cells and pupal casings, but further study is needed! Check out those dark wings! Preferred Forage: Andrena prunorum feeds on a diverse range of forage, including the prunus trees (stone fruits and cherry trees) for which they are named. They will also feed on flowers from Rosaceae (rose family), Asteraceae (aster family) and Amelanchier (serviceberry shrubs) genus. Active Season: In the Pacific Northwest, the males will emerge first and are followed shortly by the females in late spring. Females are active from April through July, and it is possible in some regions and seasons that they may be able to produce two generations. Fun fact: Like other mining bees, Andrena prunorum bees have basitibial plates between their femur and tibial sections (think bee’s knees). These rigid plates help the bee to brace in her nest, assisting with excavation.